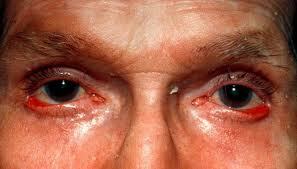 Ectropion is the turning out of the lower eyelid (eversion) such that the inner eyelid surface(conjunctiva) is exposed. It is a medical condition (eyelid malposition / condition / disease), which may result because of the weakening of tissues of the lower eyelid. Ectropion is classified into the different types. Contraindications to surgical repair of ectropion are usually dependent on the medical physical condition of the affected individual. Uncontrolled systemic hypertension, diabetes, vascular disease, or cardiac disease, as well as systemic anticoagulation (eg, with aspirin, clopidogrel, or warfarin), may be contraindications. These issues are discussed with the primary physician before surgery. A lateral canthotomy is performed by making a 6- to 8-mm incision through the lateral canthal angle. The length of this incision may vary; for eyelids with extreme horizontal laxity, it can be lengthened to anticipate a larger amount of skin and orbicularis oculi redundancy, at the conclusion of the horizontal tightening. Inferior cantholysis is performed with a scissors. It is not necessary to lyse every fiber of the inferior canthal tendon crux; cantholysis should be just sufficient to permit adequate lateral pulling of the lid for the purposes of tightening. Overly zealous dissection will cause more bleeding from an already tight operative space, without adding much to the procedure’s efficacy. Hemostasis should be obtained with a monopolar or bipolar cautery. The palpebral conjunctiva and the lower-lid retractors are then cut and disinserted from the inferior border of the tarsus from lateral to medial for the appropriate distance. This disinsertion is required in most instances of horizontal tightening. If only a small tuck of the lateral canthal tendon is required, medial dissection is minimal. A prepared strip of tarsus is visualized, then rotated laterally to allow the surgeon to judge the amount of redundant tissue to excise. The area to be excised is marked or scored to prevent over-resection or under-resection. The part of the strip to be attached at the lateral orbital tubercle is then debrided of conjunctival epithelium by shaving with a No. 15 Bard-Parker blade. The lid margin epithelium is similarly removed with either sharp scissors or a monopolar cautery. These 2 maneuvers avoid burying epithelial tissues. The excess horizontal tendon and tarsal tissue is then cut along the marked borders. A 4-0 polyglactin suture is passed though the prepared strip of tarsus; a single pass from anterior to posterior is usually sufficient. The needle is then repositioned on the needle driver and passed through the periosteum at the level of the lateral orbital tubercle. This is a somewhat deep suture pass, and visualization of the needle is difficult. Passage is aided be the use of the semicircular P-2 needle, which requires minimal rotation of the needle tip and hub and reduces the risk of inadvertent soft tissue (and globe) injury. After a solid bite of periosteum is obtained, the sutures ends are overlapped so that the effect of tightening can be observed. If the newly created lateral insertion is too high or too low, the suture should be removed and replaced. The same is true if the insertion is too deep in the orbit or too superficial. Once a satisfactory insertion is achieved, the suture is tied down with multiple square knots. The lateral canthal angle is then repaired with either a 6-0 polypropylene suture or a dissolvable suture of 6-0 fast-absorbing gut. The suture should pass just inferior to the lower-lid lash line of the new canthal angle and should exit at the eyelid margin. The suture is then directed through the lid margin of the upper lid, exiting just superior to the lash line. Multiple square knots are used for fixation. v Consecutive Entropion (eyelid turning inwards) – Consecutive entropion after ectropion repair, occurs due to over corrected ectropion. It should be managed with early massage or targeted suture removal, but surgical revision is occasionally required, if this persists.